Have you ever seen the Biscuiteers website? 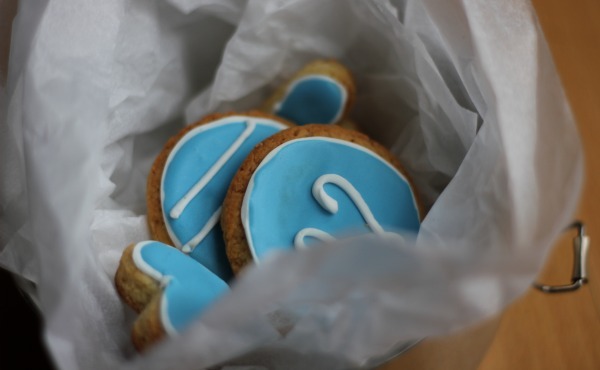 They make these fantastic iced biscuits that you can send through the post, kinda like sending flowers but more tasty. Their designs are pretty cool and even cooler, at the end of last year, they brought out a really nice book. 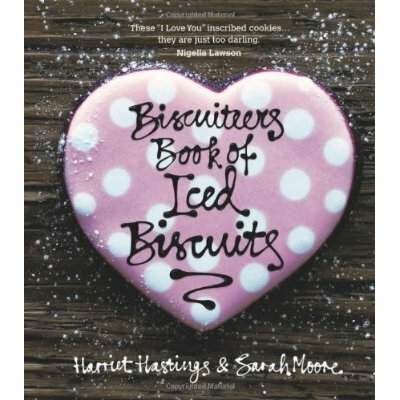 It's called 'The Biscuiteers Book of Iced Biscuits'. Its got lots of beautiful photos, recipes for biscuit dough and icing, useful tips and templates you can trace if you don't have any cutters! So I chose it as part of my prize from the video competition. Now. It turns out these are a little bit more difficult than your average cookie. Piping icing is not hard to do per se, but piping it neatly so you can tell what it is? That's another story! So here are some pictures of my first attempt at iced biscuits. I've got a long way to go before I'm at Biscuiteer level! Your biscuits came out lovely! I love the icing colors you chose.